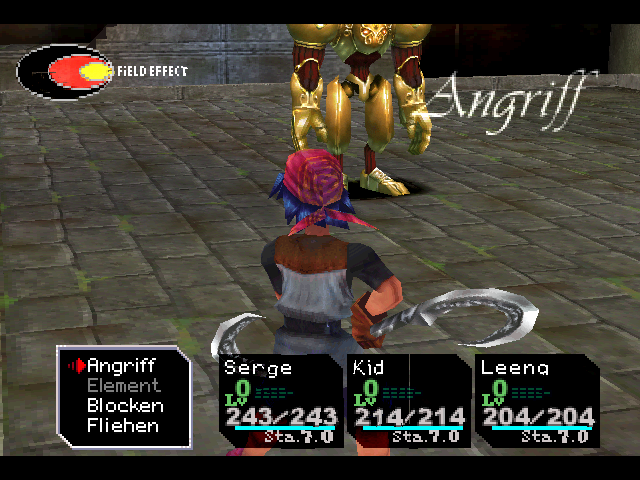 I'm working on a German translation of Chrono Cross right now, using the translation tools by Terminus Traduction. I've already translated a fair bit of the graphics and managed to re-insert them but I have a lot of questions and some problems I wasn't able solve yet. So I'm wondering if there's anyone who's familiar with these tools and who would like to help me out if I have any questions - because I'll have quite a lot and I don't want to use a thread for every single question or problem I have, haha! As a little thing to show: I just finished translating parts of the battle screen today. Hello Shokupanda, this is awesome! I love translation projects. I've played a little with Terminus Traduction myself but unfortunately found it too confusing. However, I'm sure there's someone around here who knows how to work it well. And perhaps I can open it up again and try learning something along with you. I am quite surprised there isn't a German translation already out there! Regardless, just popped by to offer encouragement. Welcome! I played around with the TT tools last year and mostly got the hang of them. I can probably answer questions you have.